Complete your outfit with these aviator-styled Ray-Ban unisex sunglasses, featuring violet mirrored lenses with the Ray-Ban logo on the right lens for a stylish look that's a great choice for the summer. Featuring UV protection, these sunglasses protect your eyes from the sun, and the sunglasses come with a cloth to keep the lenses clean and a case to keep them secure. Very good glasses for summertime. I ordered the purple flash lens Ray Ban aviators from overstock.com. I am a big fan of aviators & I'm not disappointed with these. They're very cute & I will enjoy wearing them this summer. Great pair of glasses. Came in a rayban case with a cleaning cloth and everything. They are mirrored which I like and you can't see my eyes through the lenses which is exactly what I wanted. All in all grey pair of sunglasses! Ray-Ban's are the best and these are spectacular. Love, love love the frames and the lens color. I have a small face and aviator sunglasses always overwhelmed my face and made me look "bug eyed" but NOT these. The color of the glasses are a darker purple than the picture depicts but I am glad they are darker because it goes better with more skin tones and hair colors. I get compliments on them all the time and they are my go to sunglasses. So cute and they looked exactly like picture!! Highly suggest and super trendy! Present for daughter's sweet 16 - she loved them, came in a nice ray-ban glass case, with a glass wipe to keep glasses clean. Mirrored purple. Exactly as described. Would purchase again!! These sunglasses are lightweight for being made of all metal. The lenses are a bright purple and mirrored. I love these glasses!!! They're perfect for summer. I have both the green and blue flash lenses already. Purple is my favorite color so I had to buy them. I love the copper frames. The lenses are a bit see through, but so pretty. LIGHTWEIGHT - LOVE THE COLOR - AND SO WEARABLE AND NON-BULKY. RB HAS BEEN A STAPLE IN MY EYEWEAR FOR MANY YEARS..NOW - THEY ARE GETTING EVEN MORE FASHION CONSCIOUS ---LOVE THE LOOK - RETRO AVIATOR. They are petite on my face which I love because I have a smaller face and cannot wear the bigger size. This frame is described as "large," but if you have purchased from Ray-Ban, this is not their largest frame. Also, Overstock advertises FREE shipping & returns. However, being charged $ for the return. Will shop elsewhere in the future. I really like these. The purple color is really nice. I wear silver medals, so I would’ve preferred to have silver frames, but they are still nice as is. My child attends a school with purple and gold colors so these are perfect for game days. I normally buy club masters, so this was a nice switch up for me. Absolutely love them! Exactly as pictured. "What size frames are these? 55 or 58?" "How see through are the lenses? Can you see your eyes right through them?" The lenses are mirrored and fairly opaque. You cannot really see your eyes. The lenses are a little darker than pictured and mirrored. "are the lenses mirrored can you see your eyes"
The lens are mirrored in violet. The lenses are mirrored and no you can't see your eyes. "are these the lilac or violet lenses?" The lenses are closer to violet. Hello gor8drs, the lenses are not polarized. Please let us know if you have additional questions. Thanks for shopping with us. "is the frame gold or copper?" Hello maggiemac, the frame is gold. Please let us know if you have any further questions. 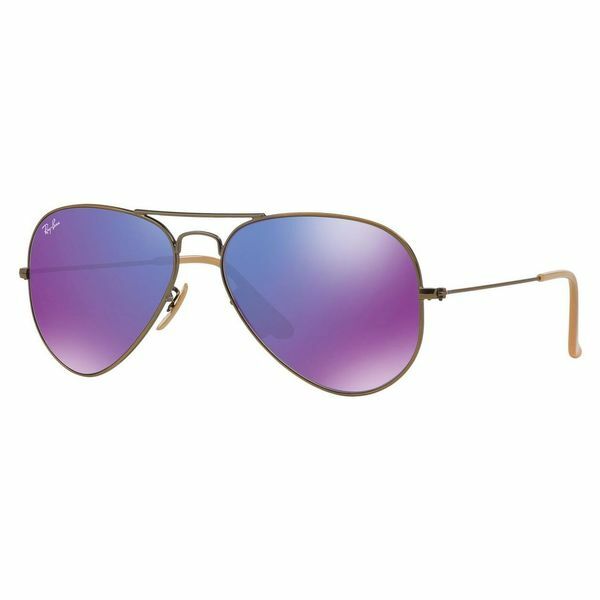 I was looking for a new pair of the classic Ray-Ban Aviators and purple is my favorite color...along with the price was a no-brainer! Looking forward to getting these! I'm a first time shopper with overstock.com.